The Mount Rushmore National Memorial is a sculpture carved into the granite face of Mount Rushmore near Keystone, South Dakota. Mount Rushmore features 60 foot high carvings of U.S. presidents George Washington, Thomas Jefferson, Theodore Roosevelt, and Abraham Lincoln to represent the first 150 years of American history. 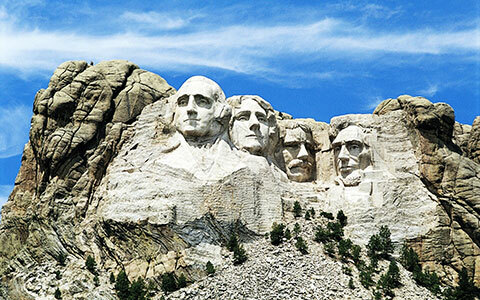 Mount Rushmore is the state’s top tourist attraction. The memorial hosts nearly three million visitors a year. 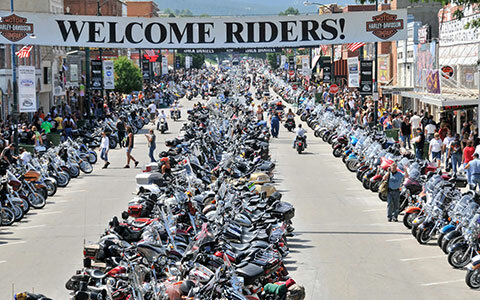 The Sturgis Motorcycle Rally is an American motorcycle rally held annually in Sturgis, South Dakota, usually during the first full week of August. It began in the mid-20th century and was originally held for stunts and races, but has evolved into being a meeting for motorcycle enthusiasts from around the country. It brings a lot of income to the citizens of Sturgis. Today, it is one of the largest motorcycle rallies in the world. 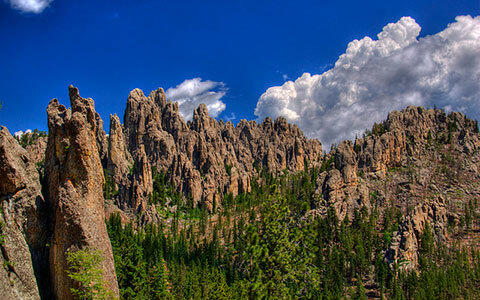 The Black Hills are a small, isolated mountain range rising from the Great Plains of North America in western South Dakota and extending into Wyoming. Harney Peak, which rises to 7,244 feet, is the range’s highest summit. The Black Hills encompass the Black Hills National Forest and are home to the tallest peaks of continental North America east of the Rockies. The name “Black Hills” is a translation of the Lakota Pahá Sápa. The hills were so-called because of their dark appearance from a distance, as they were covered in trees. 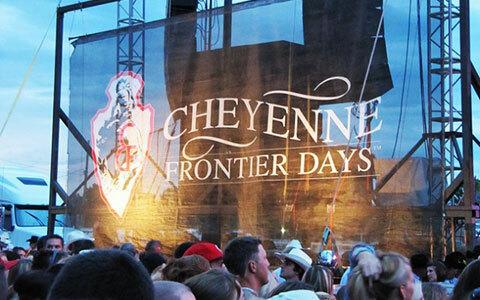 Cheyenne Frontier Days is an outdoor rodeo and western celebration held annually since 1897 in Cheyenne, Wyoming. The event, claimed to be one of the largest of its kind in the world, draws nearly 200,000 people every year. Lodging fills up quickly during the peak tourist season throughout southern and eastern Wyoming and even into Colorado and Nebraska. The celebration is held during the ten days centered about the last full week of July. © Copyright 2019 Big D Oil Co. All rights reserved.